Bang & Olufsen�s new mobile phone, Serene, was presented to the public at the Louis Vuitton grand store opening on Champs Elys�es in Paris for the very first time. To accompany the new mobile phone, Serene, Louis Vuitton has developed a leather case specifically and exclusively for Bang & Olufsen. Loyal to the vision of their founders, both companies share the same passion for innovation and modernity. From the start, both have established a tradition for creating state of the art products that use the newest materials and technologies, while paying careful attention to elegance, beauty and durability. 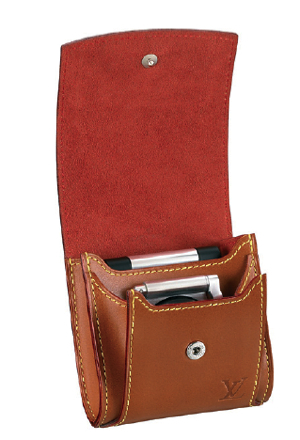 The leather case contains a main compartment for Serene and a front compartment for a Bluetooth headset. It has a removable leather necklace and a belt loop, so you have different options for carrying your mobile phone. The leather case is made in the most exquisite Nomade leather. The Nomade series is selected for some exceptional items of luggage, bags, shoes and accessories. Louis Vuitton has chosen the best cowhide leathers with a totally flawless surface. Tanned with plant extracts, natural cowhide leather develops an elegant copper-toned patina with time. The lining is made of micro fibres and the brushed palladium metallic pieces add a final touch to the total impression. The leather case totally dresses Serene, yet allows easy operation and access to all features available. This entry was posted on Sunday, October 30th, 2005 at 12:16 pm	and is filed under Delectable Gems. You can follow any responses to this entry through the RSS 2.0 feed. Responses are currently closed, but you can trackback from your own site. Entries (RSS) and Comments (RSS). 18 queries. 0.021 seconds.